Looking for a spacious 2 bedroom unit with a sublime ocean view that's only 120 feet from the shoreline of a sandy beach? King-size bed a must- have? Washer/dryer? Look no further. Mort's Port (aka unit 310 Kanai A Nalu) awaits your arrival in beautiful Maalaea Harbor Village. To see if we have dates open that would work for you, click on the Rates and Availability page. Only hit a button that says or means "Book Now" if you are ready to commit to the rental. Otherwise, "Ask Owner a Question" to get info to help you decide if Mort's Port is your best choice. If you do book a stay in Mort's Port, this is what we can predict: You won't want to leave. Once you walk into this superb third floor unit in Kanai A Nalu, you'll understand why. The wall-to-wall glass that separates the living area from the lanai presents an astounding and expansive ocean view. The gentle trade winds, the swaying palms, and the sound of the waves will enchant you. If you have ever stayed in the more tourist-populated parts of the island, you will appreciate the relative seclusion and quiet nature of Maalaea. 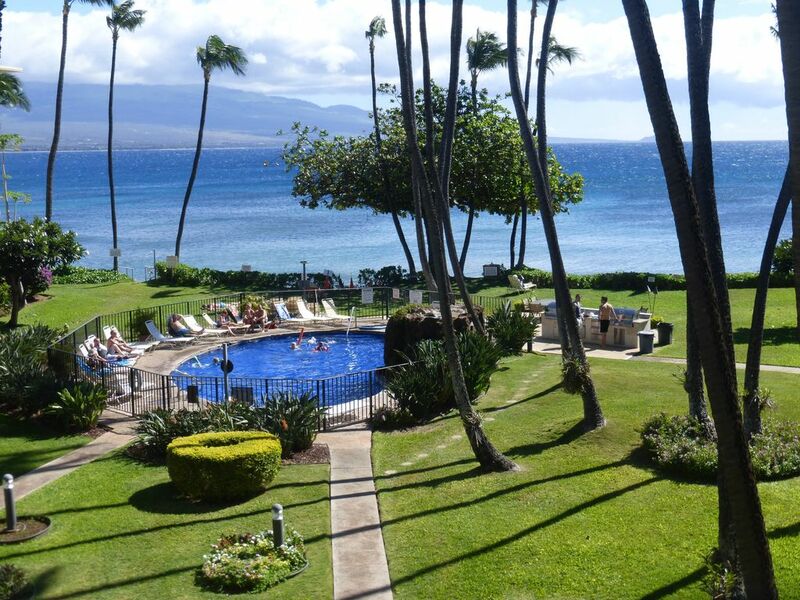 Within walking distance are the shops and oceanview restaurants at Maalaea Harbor. You'll also find boats departing for snorkeling, diving, and whale watching adventures. The Maui Ocean Center, as impressive an aquarium as you'll find anywhere is also in the harbor area. If you want to get in the water, you can go down to the sandy beach below the courtyard to swim, snorkel, or have fun with a boogie board. Of course, there is always the option to take a dip in the gated pool located in the center of the courtyard. If you want to take a scenic walk (or run) along the shoreline, you can go for miles on Sugar Beach, which has just two oceanfront condo buildings beyond ours to the east. Then you're on a vast stretch of sand alongside the Kealia nature preserve, an area that will never be developed. The condo complex is well constructed (concrete walls and ceilings) and well maintained. Our two bedrooms are real rooms with real doors, not lofts and not sliding screens. If you like your privacy, you will like staying in Mort's Port. What you see when you walk in the front door (assuming the blinds have been rolled up) is breath-taking. Unlike the majority of oceanview units in our building that are on an angle and present a view of other units across the way, our straight-out view is your visual treat from almost anywhere inside, even the kitchen. While cooking you can look through the living and dining areas and see the ocean's swath of blue. You'll never forget that you are in Hawaii with this beautiful panorama. When you can pry your eyes from the awesome views of the ocean and Mt. Haleakala (a dormant volcano), you'll notice that the grounds are so well landscaped and manicured that you might think you're in a botanical garden. Even the swimming pool is a visual delight with its tropical-flower-adorned waterfall continuously spilling fresh water down one side. Just as impressive as what you see outside is what you will find inside the condo. The unit is tastefully decorated, featuring rattan living and dining furniture from the Kauai Collection. Throughout, you will find Hawaiian-themed artwork, mostly by local artists. Décor includes wood carvings, raku pottery, and prints of scenic paintings. (There are also several original-by-owner-Sue watercolors). You will rejoice at your selection of this condo unit if any of the following are important to you: FAST, PASSWORD-PROTECTED FREE WIFI ; HD FLATSCREEN TVs with CABLE AND DVD PLAYERS; CD's and DVD's in unit; MINI-STEREO SYSTEM; LENDING LIBRARY (no late fees ever), PORTABLE PHONE with FREE LONG DISTANCE (U.S. and Canada); A/C; IN-UNIT SAFE; SPOTTING SCOPE and BINOC's; SNORKELING EQUIPMENT; BOOGIE BOARDS; BEACH CHAIRS and UMBRELLAS; WASHER/DRYER in unit; KINGSIZE BED in MBR; TWIN BEDS (King option) in 2nd BR. Maybe not important to you now, but wait until you have settled into one of our two CUSHIONED RECLINER LOUNGE CHAIRS (both facing the TV, and one also facing the ocean). You may also find that our four CUSHIONED DINING CHAIRS ON WHEELS are more comfortable and fun to move around on than what you expected. Upgrades include a KEYLESS ENTRY system that makes arriving and leaving less challenging; BEAUTIFUL MAPLE CABINETS and PUCK LIGHTING in the kitchen; CUSTOM TILE SHOWERS (one a walk-in) and COMFORT HEIGHT TOILETS in the bathrooms. Most likely it's not what's inside that you're going to remember for a long time after you leave. Instead, it's probably going to be the incredible views from the lanai and the strolls you took along the shoreline. Imprinted in your mind will be the panoramic scene from the 3rd floor: the lush greenery and tropical flowers in the foreground, the beautiful blue waters of the bay in the middle, and the majestic Haleakala in the background. All that framed by randomly stretching palm trees to complete the picture. At night, it's just as impressive. The lights twinkling from Kihei across the bay vie for your attention with the stars more bright and more plentiful than you can imagine. You'll see. You really won't want to leave. Aloha. We are Mort and Sue, retired teachers who live near Chicago. Although we aren't able to come to Maui as often as we would like, every trip is filled with as much excitement as the cruise that introduced us to this marvelous island. Whenever we come to Mort's Port, we spend at least 50% of our time working to improve our home-away-from-home. We strive to make our unit feel as comfortable and look as appealing (in an island kind of way) as we possibly can. Kanai A Nalu is a beautiful, centrally located condominium on Maalaea Bay. The street is relatively quiet, unlike many vacation rentals in nearby towns that have constant traffic whizzing by. We like the building being all-concrete construction and the sandy beach being walkable for miles to the east. It's also nice to be so close to the harbor, restaurants, and shops. In the winter months, we have a great vantage point for seeing whales frolicking in the bay. Turtles can be seen year-round. Ours is one of the 16 oceanview units that face straight out to the water, 12 of us above ground level. That means that we have a fantastic view of the ocean, both from inside the unit and out on the lanai. Since the straight-out facing units have more lanai space than those on an angle, we are able to provide a spacious table that can accommodate every guest with nobody having their back to the ocean. Sitting on the lanai and gazing across the courtyard to the beautiful bay is close to being addictive. toilet, shower, Comfort toilet. Stone tile walk-in shower-- glass half-wall. Both bathrooms have custom painted walls employing various hues of aqua in textured strokes resembling ocean waves. It's very calming to look at. You won't get seasick. Windows in the kitchen and guest bedroom have a view of the West Maui Mountains. This unit faces straight out to the ocean with nothing but the pool and palm trees in between. Since we have these "obstructions," we are technically not oceanfront. The building itself is oceanfront, and our unit has an expansive view of the ocean. The shoreline is just 120 feet away (not counting short distance to the elevator). Portable phone gets reception anywhere in the unit and in most locations in the courtyard. Large unit (not central air) capable of cooling the whole place if bedroom doors are left open. Rarely needed. Box floor fans can assist the 4 ceiling fans if necessary for moving air around. One or two extra sets of sheets for each bed are provided. Stored in the bedroom closets. Large capacity GE new in 2016 (detergent and dryer strips provided). Large capacity GE new in 2016. Usually easy to find a spot near the closest elevator. One car per unit allowed in parking lot. A 2nd car would need to be parked along the street. Ample replacement towel sets for each bathroom. Min. of five beach towels provided for guest use. A new gym is not in the condo complex, but within walking distance. Weekly membership available. Ask owner for details. WiFi is free, fast and secure (network ID and password will be sent to you). Casual, island style. Two ridiculously comfortable upholstered recliners facing the TV--and, in the case of one, also the ocean. Blue ice in the freezer for use in insulated bags or cooler. Has glass window in the door. It loves to make Kona coffee. There's also a grinder if you want to buy coffee beans instead of grounds. Tea, coffee, seasonings and other staples. White Corelle dishes, Corningware and Pyrex in ample quantity. Table may not be suitable for younger children who could pull it over (plate glass on center base). Stable enough for 4 adults dining or playing games. Two HD flatscreen TV's (new 55" in living area, and 42" in MBR). Cable for each TV (includes visitor's channel with information about activities, sightseeing, restaurants). Mini-stereo set up on an étagère shelf. Can use for radio or CD's. Two (the newest one Blu-Ray).--one in the living area and the other in the MBR. Two shelves of books. Guests are welcome to borrow or even take home a book that hasn't been finished. Several board games and decks of cards. 19 CD's, mostly Hawaiian music. A few items for fun at the beach. Nicely manicured grass and many tropical flowers. Orchids growing in coconut husks affixed to some of the palm trees. See Lanai (a Hawaiian term for a balcony with a ceiling). The condo association provides 2 poolside tables and 10 chairs if you want to eat closer to the ocean than our lanai table. Check to see what we provide before you rent or buy any beach gear. Boogie boards, snorkles, masks, fins, etc., in guest closet. Owners not responsible for any mishaps that may occur using these. See link on Activities page of owner's website. Heated in cool weather. Has small waterfall on one side. Combo for gate lock provided in condo guidelines sent to renters. We also provide hand-painted wine glasses for special occasions, bamboo cutting boards, wooden block with Farberware knives, BBQ tools, coolers, insulated grocery totes, binoculars and spotting scope for viewing whales from the lanai, a mostly-fiction lending library, and Maui guide books. There also is an in-unit safe to securely store electronic devices and valuables..
Well equipped, accurate info/photos in description, great location for us! Just finished up our stay at Mort's Port. We really liked the central location, and that it's not in a busy area like Kihei or Lahaina. There is a lengthy beach for morning walks heading east from the property, or just sit with your toes in the sand. I followed a large green sea turtle around while snorkeling right in front of the property! While we don't eat out a lot, there are a few restaurants within walking distance which we took advantage of a couple of times. But when cooking in, we appreciated the well equipped kitchen, and the grill area overlooking the ocean is fantastic! Sue and Mort take care of their place and want to be sure that those who stay here enjoy their visit. Thanks for sharing your place with us, when our plans call for a return to Maui, I hope it will be available for us to stay. We are pleased that the two couples who spent their mutual "milestone birthdays" and one anniversary in Maui selected our condo as their lodging. It seems that it suited them well, esp. since they initially had concerns re. the A/C. It's true that we don't have central air (no unit in our complex does since it wasn't included in the original construction). We have found that our high capacity unit located mostly on the lanai, together with two box fans, can keep us cool on the rare hot days when the overhead fans (and trade winds) are not sufficient. And nights by the ocean are heavenly. The temperature is usually perfect for sleeping year-round. We have some comforters in the condo, but we're happy to see that they aren't being used. Had a wonderful stay. The condo was great and had everything we needed. We liked the central location, close to other spots on the island. The Ocean view from the condo was amazing! Vicky let us know that she and her sister enjoyed the view from the lanai so much that they sometimes chose to just stay there while their husbands explored the island. You can have a memorable vacation at Mort's Port regardless of what you choose to do each day. Lovely and exactly what we were looking for. The property was great. Great view. Everything we could ask for was provided. This place was very clean,well furnished and contained all the various amenities for a comfortable stay. The view of the ocean and the pool were tremendous. The beach access was important as we were 100 ft from the actual beach with plenty of room to walk up and down the coast. We were close to shops and other attractions. Sue and Mort provided all the information about the condo as well as giving us excellent suggestions on restaurants and activities on the island that they had personally experienced. Stay here you won’t be disappointed. We had a wonderful stay at Morts Port. The location was perfect - nice shops and good food within walking distance and a short drive to all things we wanted to do/see. Sue and Mort supplied everything we needed at the condo; as well as lots of practical information for exploring the island. We were able to have a separate bedroom and bathroom from the kids for less than the price of one room in a resort. We also loved the private beach. Thanks Sue and Mort! We love the way comprehensive reviews like this one turn out to be our best marketing tool. Come experience what this family did. Many people enjoy taking a daily stroll along the shoreline of Maalaea Bay. The sandy beach begins at our condo complex and extends east all the way to Kihei (approx. 4 miles). The 7 condo buildings to our west are not on a sandy beach, but there is a sidewalk by the road that people staying in those condos can take get to a starting point for their shoreline walking. Most of the time Maalaea Bay is calm enough for swimming, snorkeling, kayaking, and boogie- or paddle--boarding. CANCELLATION POLICY: 60 days or more in advance of start date: 100% refund 30-59 days in advance: 50% refund MISC. : If you are concerned about having to cancel or curtail your vacation due to health issues or possible death/severe illness of a loved one, you are strongly urged to consider securing traveler's insurance. It would cover not only the amount of the forfeited rent, but also transportation expenses. Arrival time is 2pm or later. Check out is 10am. An extension to noon might be available upon request at least a week in advance. For late departure flights, we recommend booking an additional half day at 50% of the daily rate plus tax. Mention this request at the time of booking, so adjustments can be made in the rent total and tax. It can't be adjusted later. The sofa is not a sleeper sofa, so the maximum number of people who should be staying in the unit is four. There will be no exceptions to this regulation. When there are two people staying in the guest bedroom, you will have the choice of having the beds left as twins or made into a king. The request for a king will only be honored if made at least a week in advance of arrival, preferably at the time of booking. A $20 gratuity is suggested for the cleaning staff who have to rearrange furniture for a king.